Emma gained a BA Honours English degree from Exeter University and after abandoning a promising career in journalism (writing for national magazines and newspapers) she gave in to the little voices and did a post-graduate acting course at Arts Educational. 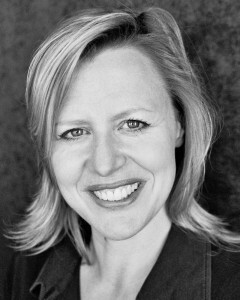 She now combines acting with directing, teaching, singing, voiceover work, corporate consultancy and script writing. Theatre highlights include: Polly Garter in ‘Under Milk Wood’, Lorraine Sheldon in ‘The Man Who Came to Dinner’, the Wife of Bath in ‘The Canterbury Tales’, Stella in ‘Whale Music’, the title role in the all-female Soho Group’s ‘Macbeth’, Mrs Malaprop in ‘The Rivals’, Ingrid in ‘Blavatsky’s Tower’, Margaret in ‘My Mother Said I Never Should’, Alex in ‘On the Verge’, and most recently Miss Lassiter in the Mitchell/Nixon musical ‘The Opinionmakers’. Way back in the early Nineties she comprised one half of character comedy duo Kilbey & Larkin (Pleasance, Edinburgh Festival, London comedy circuit). Radio and voiceover include Radio One jingles, Cheddar Gorge audioguide, ‘Kath and Kim’ ringtone catchphrases and Lucy in ‘The Country Wife’ for Radio 3. TV includes ‘EastEnders’ and ’The Stand-Up Show’ for Live TV. Directing highlights: ‘The Fastest Clock in the Universe’ by Philip Ridley, ‘Talk’ by Mark Wilson, ’Baby with the Bathwater’ by Christopher Durang, ‘The Caretaker’ by Harold Pinter, ‘A Wedding Story’ by Bryony Lavery, ‘Steal Compass, Drive North, Disappear’ and ‘The Growing Room’ by Rachel Blackman and ‘The No 9 Bus to Utopia’ by David Bramwell. She is a founder member, performer and writer for Brighton-based Radio City Theatre (Theatre Royal, Brighton) www.radiocitytheatre.com. Shift is Emma’s first self-penned solo show, loosely inspired by her time as a Samaritan.